A wedding band is an important purchase. Your groom is going to wear it for the rest of his life, so you need to make sure that it matches his personality, his style, and his lifestyle. 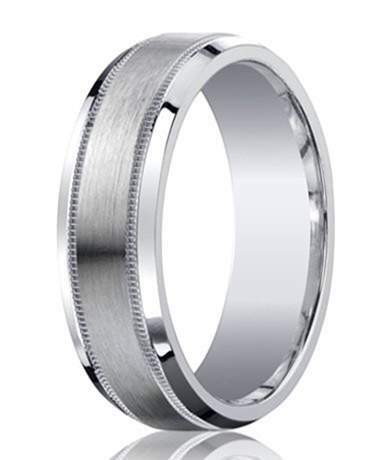 Our 7mm designer Argentium silver decorative edge wedding ring with satin finish and polished beveled edges is for the refined man of taste, someone who can appreciate the classics but prefers a contemporary twist. Featuring a slim textured border and polished beveled edges, this ring has a timeless quality that transcends the traditional wedding ring. At 7mm in width, this silver decorative edge band is made from the finest quality Argentium silver and has a comfort-fit interior. We recommend seeing a professional to have your groom's finger measured for a comfort fit ring before placing your order. Comfort fit rings usually measure ½ size smaller due to the additional metal inside the ring. Our 7mm designer Argentium silver decorative edge wedding ring with satin finish and polished beveled edges is an affordable and luxurious option for the couple who needs to budget but doesn't want to sacrifice quality. We even offer personalization with engravings up to 30 characters. Great ring. Nice design. After I lost my white gold wedding band twice this became my safety ring. The quality of the ring and workmanship are excellent.